If you have lost your negatives and would like to reprint your old pictures, or maybe your memory card has corrupted and you only have prints left, this is the service for you. Whether your original print is large or small, damaged or spotless we can scan it, print it and supply it to you on CD from £12.50. Producing prints from an existing print. Perhaps your print isn’t old, but sometimes negatives go missing and memory cards become corrupt, how frustrating. Lost or misplaced films and digital files can mean that the print we hold in our hand is the last remaining copy. Have no fear, the CC team are here to reproduce your print. We can scan your original to a variety of sizes, bigger or smaller. Not only that, we can clean and restore aged prints back to their full glory. You can Post your original print to us or drop it in if you are local. For mail order customers, please remember to fill out a Job Sheet outlining your desired print size, quantity, level of restoration and print surface. After scanning your original, we will resize the image to your desired print size and colour correct it to a good match. Your scan will be printed and you will also receive the scan on CD for future re-orders. What size is your original and how large would you like it reprinting. We find that many customers wish to reproduce their photos at the same size. With this in mind we have simplified our ‘Print from Print’ services and created 4 main options (standard & large). You may have noticed a strange phrase or 2, so for starters, let us explain what RIP means. RIP is a photographic acronym for Rest In Proportion. If we know the length of side ‘A’, side ‘B’ is the relative height or RIP. Below is an outline of out standard services. If your original print has a longest side of 6 inches or less, this is the service for you. Scans are produced at a width of 1800 pixels along the longest side and prints will be produced at the same size as your original. If your original has a longest side above 6 inches but less than 12 inches, this is what you need. Alternatively, if your original print is smaller than this, but you want a print that is bigger, you can choose this service. Scans are produced at a width of 3600 pixels along the longest side and the included print will be up to 12×12 inches. If you have an original print sized at A4 or below, we can scan this on our Imacon, an industry standard virtual drum scanner. The Imacon produces an extremely high resolution scan from your original, allowing us to print it at a much larger size. Scanning at larger sizes offers a great deal of flexibility as you can print the scanned image at a variety of sizes (making it ideal for photo gifts and posters). For artists looking to digitise and reproduce their work our Art Reproduction service is just the job. We use digital medium format cameras and balanced lighting to photograph your large original in a controlled environment. If you have a print or piece of original artwork that is larger than A4, this is the service for you. 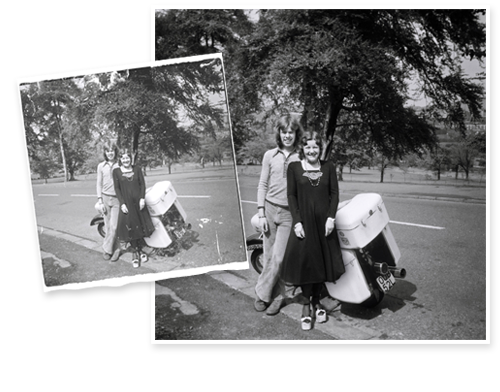 We will digitise your large original, colour match it and supply the file on CD. For more information please see Art Reproduction. Restoring and rebuilding your damaged prints. It’s torn, it’s ragged, it’s passed it’s best, but it’s still one of the most precious items you own. Photographs are wonderful windows into our past, but time takes its toll and after all, photographs are only made of paper. If your photograph has frayed corners, folds, scrates or has faded over the years, amazing things can be accomplished by a skilled retoucher. To keep things simple we have priced digital restoration by duration from as little as £15.00. If your image requires significant editing, could commission a complete restoration job or just a partial one to remove the worst problems, the choice is yours. It is difficult to suggest which rate would apply to your photograph as this is based on damage. However, in general a partial restoration will cover photographs which have creased corners, light scratching and folds. Full restoration is required when scratches, folds or other types of damage occurs across the majority of your photograph or has disfigured individuals within the image. For more information, see our Retouching page. file on CD & one print sized up to A4.